My point was that the relational model, SQL, complex types, and user defined types work handsomely together. If you look at Oracle, DB2, PostgreSQL, SQL Server you'll see they have made lots of enhancements over the years to beef up their indexing, storage etc, so that YES your specialty types get treated with the same care that they provide for their more standard packaged types. That means you can write SQL that say outputs a geometry, a person's name, or a subset of data from an XML field and that can navigate data with a simple btree join or an RTree based join and then on top of that do further filtering using specialty functions many of which can also make use of specialty indexes or to output a subset of data of a larger object. This combination in my book is much more powerful than creating a separate database to for example store just graphs, or full text engine, or navigable documents. The reality is that related data comes in all shapes and forms and can be related to other data in a different shape and form. It is rare that a document storage proposed by JSON (Couch Db, MongDB etc.) is ideal for all your data just as it is rare that all your data should be finely normalized and broken up into columns with a canned set of types we are used to working with. I am not bashing the NoSQL folks by any means. If all you want to do is that, then I'm all for simplicity and simplicity is best if it satisfies all or most of your needs or is significantly faster. For my apps however I need something a little more that can handle all my specialty needs. My needs for navigating across space, across nested relationships, and every so often querying an arbitrary bag of properties (e.g hstore, json, xml) without having to join with many more tables, and even use a more suitable syntax such as the syntax for querying full text data. This is why I choose PostgreSQL, because it lets me do all of that and lets me do it with my favorite language SQL and most of the time with a single SQL statement. Also please stop with these arguments about how SQL does not mean Relational and not what Codd had intended. I know all of that, but I still like it never the less and whether you like it or not, the databases we classify as relational HAVE standardized on SQL and SQL ain't a naughty word. Two exciting things happened this past month. Our article on upcoming PostGIS 2.0 recently came out in GeoInformatics Magazine December 2011 Issue 8. Check it out here. Starts on page 30. We just got notice that our book proposal has been accepted and this time it's not about PostGIS. This upcoming book is planned to be about PostgreSQL only. We are hoping to show case some of the features that make PostgreSQL stand out from the pack with more focus on 9.1 and 9.2 releases and how PostgreSQL has changed over the past releases from 8.3 on. So a bit of coverage on the various stored procedure languages you can program in, building aggregates, the plethora of extensions and data types that can make your database an application platform power house. Also of course basic stuff you'd expect from any enterprise database -- e.g. user and permissions management, backup/restore, replication etc. More on that as the time gets closer and the contract gets on the way. As mentioned in Lessons Learned Packaging PostGIS extensions, I am working on PostGIS 2.0.0 extension packaging. One of the things I wanted to know was what objects, types, functions etc were installed by my extension. The new packaging system allows for cataloging this relatively easily, but I couldn't find a function or view for this and didn't see one mentioned in the manual, so I created this query which seems to work pretty well as far as I can tell. The basic idea being that any object that an extension depends on that is not an extension is part of the extension package. How big is my database? How big are my databases? In this example we sum up the sizes of all databases in the current PostgreSQL instance. Note: we have to cast the size to bigint since the SUM function returns a numeric when summing bigints and pg_pretty_size expects a bigint. In this case the raw_size is a bit useful since it lets us know we've got more than this database in our cluster. Since my current database dwarfs the size of the others, I also would like to know how big things are without it. Querying the PostgreSQL catalog, here are all the size function gems I've found. I'm especially fond of pg_column_size which tells you how much space an object would take up if it were stored in a table field. One of my favorite tools and I think that of many folks working with GIS and other kinds of Multimedia is the GDAL/OGR suite. Though I started using it to conquer GIS ETL activities, I found myself using it for problems that are inherently not GIS at all. I talked about the GDAL OGR2OGR component a while ago in GDAL OGR2OGR for Data Loading and this time I'll talk tangentially about its raster capabilities. It is a fantastic tool for converting between various raster formats and applying various raster operations. In PostGIS world the new 2.0 raster functionality puts an SQL wrapper around much of its power. I'm not going to talk about that though except as a fleeting comment to explore later (we've got cool 2 band Map Algebra in PostGIS 2.0 to flaunt its stuff). So what does this have to do with XPathing XML data with PostgreSQL? Well that's what I'm going to talk about what to do with machine generated data that comes at you in XML format. A lot of machine generated data is hitting us in an XML like form. I talked about GPX data and navigating that in Which by the way GDAL/OGR can load and export easily into/out of a PostGIS enabled database. GDAL exposes another kind of machine generated data in XML format which turns out to be very useful for all kinds of things. This is Exchangeable image file format (EXIF) data. There are all kinds of random text information embedded in pictures and this varies depending on what camera is taking it. Newer cameras like the ones you have built into your iphone or android embed location based information into them sometimes like where you were standing when you took the picture. Most cameras these days embed the time the picture was taken. This information is important because if you are taking electronic notes while you are snapping your pictures, it provides an easy way to match up your notes with the picture about the object. So what does this EXIF info look like when you point GDAL at it? We'll see. Stuffing XML data in PostgreSQL, but that's not really relational is it? Okay you thought PostgreSQL was a relational database right and relational databases have no business mucking with XML data or other kinds of data structures for that matter that don't fit into a nice normalized square hole. I've got a folder of pictures and holy shmoly they have images and they've got this text information built into the image. I have no time to figure out what this data is or put it in an orderly fashion, so I bring it all in with a structure something like below. Most of it will be junk that I don't even want to waste time putting into a structure. This is just a single insert for demonstration, that stuffs the xml generated by GDAL for each picture into a table. Don't worry I do have a routine for scanning my folder in bringing inserting this info. I may have use for the other stuff in this xml glob some other day, but for today I really only care about the time the picture was taken which we all know you can't count on the creation time of the file itself since it looses it when copied from device to device, but the EXIF timestamp doesn't change. Perhaps another day I'd be interested in the GPS info, but not today. So how do I grab the timestamp, I use XPATH of course with a little dash of regular expressions. So what did I just do in this snippet of code: I grabbed the second MetaData element and grabbed the first MDI element of that that has key = EXIF_DateTimeDigitized. The format doesn't give me something I can easily cast to a timestamp because of those colons, so I use a regular expression to replace the :s following the Year, month, and day with a - and then I cast to a timestamp. 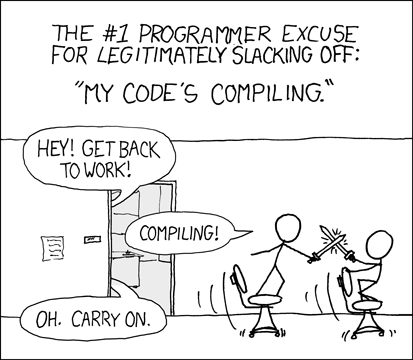 The \\1, \\2,\\3 is backrefencing syntax that would return year, month , day. What happens when you take a bunch of auto-generated tests and test results which you burn into rasters with SQL? You get a code fingerprint of sorts. Well that was the dream I wanted to explore. Now that PostGIS 2.0 has introduced a new spatial type called raster and lots of functionality including some very cool Map Algebra functionality to go with it, this is now possible without too much fuss. My first attempt at it didn't produce quite what I expected. I have to admit it is absolutely gorgeous and will be hopefully useful once I figure out how to read it, tweak the rendering process to achieve more of a breakout of results, or patent it as a fabric style. Now for the story of how a computer nerd is born and how rasters can be useful to nerds. When I was a kid of yeh 9 or 10 years of age, I used to write code in BASIC , save it to a data tape recorder/player, and then listen to the signals on an audio tape recorder/player. I found it amusing that both devices utilized the same media but expressed the signals a bit differently. I put myself to sleep with those sounds much like normal kids listen to human generated music: the screeching, the abrupt changes in pitch that sounded to me like cars gliding along and then crashing into each other ; I wondered what piece of my code was playing at this very moment?. Looking down an electronic microscope when I was working in a molecular biology lab in high school brought similar joy. I thought wow that looks like the universe being born. Thus started my long time love and fascination with data and signal processing. Raster's (imagery) are matrices (often sparse) and n-dimensional in nature where you can think of each band as a dimension. They are fundamentally a data storage /presentation mechanism often for environmentally generated data with visualization being one mechanism of expression. I had a dream recently about how would I digest all the PostGIS battery of tests into something I can quickly scan, compare, overlay much like a doctor's X-ray, and diagnose problems. Ah I see a problem and it's right there!. That is what Map Algebra is for and the combination with SQL I find pretty hot. Sadly its only a hotness that computer nerds can probably appreciate so nothing I can discuss in family gatherings except possibly with my brother. That brings up the question of how can you represent right there? What does right there mean when it is not about physical space? If I asked you, given these failures, where in your code is right there? if you are intimately familiar with your code, you probably have a spot in your brain that has mapped out an almost physical map of all the parts of your code, such that right there is just as physical of a place to be as the ground you walk on though perhaps with more dimensions than the ground you walk on. While we think of space as being physical -- that is merely a manifestation of it. Its positioning is purely based on how you define its continuity. So I thought to myself, if I could look at the tests in the context of some continuum of space, how would I define it so that I could quickly grasp the meaning of 80,000 tests in one glance? So in short converting my mental map to something visual that had little blip lights telling me where there are problems. Imagine a grid where each cell defines a different test. The rows and columns are somewhat arbitrarily broken -- mostly so I can fit it on my monitor. I could just as well have a 1-row many many column strand like DNA. Now what do I put in those cells? Well my cells have bands where each band stores a different metric of my test as a number. 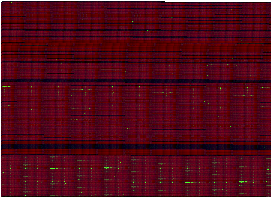 I've got a band defining the complexity of inputs to the test (which I visualize as a reddish color). A band to measure how long the test took -- if it fails the value is null (undefined) and this I visualize as greenish. Now my tests are generated by running through functions in sequence often in family order of functions with family order of inputs, so in a sense a function test next door is more closely related than a test further away. So there is a continuum of sorts even if it is in just my head. We've just defined a raster and rasters of this type created from the same battery of tests will map out the same space assuming we define our space continuum the same. This means you can overlay two batteries of tests and compare them pixel by pixel across each band and they overlay perfectly. More importantly you can just look at the generated raster (after you apply some transformations to make it viewable), and with some coaching have those millions of sensors in your eye register -- Ah the problem is right there! and that right there would now have an uncontestable visual manifestation. Later on I'll demonstrate some concrete code that explores what we PostGIS devs like to call Seamless Vector Raster operations. Those who think "relational databases" should not be performing these sacrilegious exercises may not want to view the next episode or may choose to keep their eyes closed lest they turn to stone. For those who aren't familiar with hstore, it's a key/value storage type that is packaged as an extension or contrib in PostgreSQL 8.2+. In PostgreSQL 9.0 it got a little extra loving in several ways one of which was the introduction of the hstore(record) casting function that converts a record to an hstore. In this article, I'll demonstrate how you can use this new casting function to do very sleek mail merges right in the database. The only caveat is that it seems to only correctly name the keys if it is fed a real table or view. Derived queries such as aggregates etc get keys named f1, f2, etc. If you are on PostgreSQL 9.1 or above installing -- hstore is just a CREATE EXTENSION hstore; sql command away. If you are on a lower version of PostgreSQL, you can usually find the hstore.sql in share/contribs. Records are narly things because they are hard to inspect and shuffle around in the database. The main reason is that its hard to get at the columns without knowing the column names before hand. In order to create a generic merging function that will take say a template and macro-replace any named column with the value, it would be really nice to have a simple key-value format instead of a row column format. Here is where hstore comes in handy. DCH       | "business"=>"Dewey, Cheetham, and Howe", "client_id"=>"DCH", "contact_name"=>"John Dewey"
IYS       | "business"=>"Investigators at Your Service", "client_id"=>"IYS", "contact_name"=>"Spencer Tracey"
ABC       | "business"=>"It is all about ABC", "client_id"=>"ABC", "contact_name"=>"Abby Back"
| You are cordially invited to our party. Now as I mentioned before, if you try to create a subquery and convert the subquery row to an hstore, your keys become pretty useless f1,f2,f3, etc, but luckily we can merge hstores. For this exercise, lets suppose we've got some items we REALLY REALLY want, like a little girl wants a pony for christmas. So we want each invited guest to bring us a present, but we don't want any guest to bring the same present because who needs 2 ponies, so we want to suggest a different present to each client. DCH       | "business"=>"Dewey, Cheetham, and Howe", "client_id"=>"DCH", "gift_name"=>"A real live fancy mouse", "contact_name"=>"John Dewey"
IYS       | "business"=>"Investigators at Your Service", "client_id"=>"IYS", "gift_name"=>"Android Phone controlled helicopter with camera"
ABC       | "business"=>"It is all about ABC", "client_id"=>"ABC", "gift_name"=>"Train set", "contact_name"=>"Abby Back"
providing you with a gift recommendation from our wish list. | providing you with a gift recommendation from our wish list.